Just in time for Halloween! I adapted the Five-Minute Slow-Cooker Chili from Quick Fix Vegetarian. The original recipe calls for black and red beans, but I went with “all black” for Halloween and instead of topping with corn kernels or avocado, I swapped in a dice of delicious roasted sweet potatoes. As you can see in the photo, the colors are perfect for Halloween. Best of all, the recipe couldn’t be easier, which is great since everyone is busy making costumes, right? The chili itself takes only minutes to assemble. 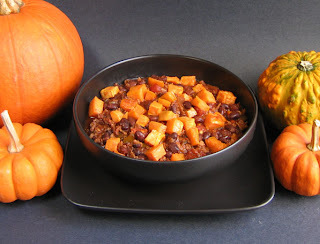 The sweet potatoes will take additional time, but you can do that while the chili is simmering in the slow cooker. This recipe is an adaptation of Five Minute Slow Cooker Chili from Quick Fix Vegetarian. 1. Pour the salsa into a 4-quart slow cooker. Stir in the chili powder and ketchup. Add the black beans, water, and salt and pepper to taste. Mix well. 2. Cover and slow-cook on HIGH for 3 hours or on LOW for 4 to 6 hours. 3. To serve, spoon the chili into shallow bowls and top each bowl with some of the roasted sweet potatoes. Alternately, you can add the roasted sweet potatoes to the entire pot of chili and stir gently to combine. NOTE: To roast sweet potatoes: Preheat the oven to 425 degrees F. Lightly oil a baking pan. Peel two medium sweet potatoes and cut them into 1/4-inch dice. Toss lightly with a little olive oil and season with salt and pepper. Arrange in a single layer on the prepared baking pan. Roast until tender inside and a little browned around the edges, about 20 minutes, turning once about halfway through. Variation: For added texture, you can add some ground veggie burger crumbles, tempeh, or seitan when you add the beans. The only thing I like better than soup is enjoying soup in cold weather. It’s like I have an internal switch that turns on right after the first frost. I instinctively reach for my soup pot and usually have something new simmering every few days until summer. Soups are wonderful. They’re easy to make, economical, and satisfying. I usually favor substantial soups that can pass for a meal: a thick and hearty black bean soup or a brothy minestrone crowded with vegetables, beans, and tiny soup pasta. Sometimes I crave Asian flavors and that’s when a tangy laksa, made with chewy rice noodles and chunks of tofu, is on the menu. Like the old song, Love the One You’re With, each soup I make is my favorite while I’m eating it. This week, I made a pot of my current favorite: spicy and flavorful callaloo. With its Caribbean origins, traditional callaloo is made with greens and seasonings native to that region, so I’ve developed a recipe using easy-to find ingredients. I call it Close to Callaloo. If you add some beans and rice, it becomes hearty enough to call dinner. This luscious soup pairs colorful vegetables with a spicy coconut broth. If your hot chiles don’t give off enough heat to suit your taste, add some cayenne to amp it up. To make it more substantial, add the optional kidney beans. Some cooked rice added to the bottom of each bowl is another good addition for turning it into a one-dish meal. This recipe is adapted from Vegan Fire & Spice. Heat the oil in a large pot over medium heat. Add the onion, garlic, bell pepper, chiles, and sweet potato. Cover and cook until softened, 10 minute. Stir in the tomatoes, broth, thyme, and allspice and bring to a boil. Reduce heat to low and simmer until the vegetables are tender, about 15 minutes. 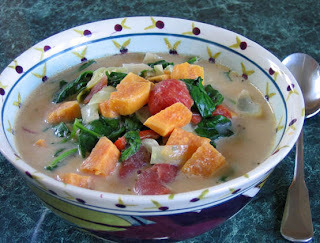 Stir in the coconut milk and greens and season to taste with salt and pepper. (The amount of salt you need will depend on the saltiness of your broth.) Continue to cook until the greens are wilted, pushing them down to cover with the broth, about 10 minutes. Stir in the kidney beans, if using. Taste and adjust seasonings. To serve ladle into soup bowls over a large spoonful of cooked rice, if using. When Erik Marcus invited me to share my Thanksgiving menu and recipes on Vegan.com, I thought it was a great idea. I’ve been making vegan Thanksgiving dinners for more than twenty years and have come up with a perfect vegan feast that is filled with traditional flavors from cranberries to pumpkins. Some years we have guests at our Thanksgiving table, but more often it’s just the two of us. I always make a huge spread with all the trimmings anyway. Of course, we always end up enjoying the leftovers for days, but each year we say “wouldn’t it be nice to share this wonderful meal with more people?” And now I can, thanks to Erik’s terrific idea. Follow this link to Vegan.com and check out my menu and recipes. Even if you have your own traditions, you may just find a new dish or two to try. I especially hope new vegans will find it helpful, as it can take the guesswork out of preparing your first vegan Thanksgiving dinner. I live in the apple country of Virginia where every small town for miles seems to be having an apple festival this month. There was a mini apple festival of sorts in my own kitchen last weekend, too, when I brought home a large bag of Stayman apples that had been picked at a local orchard. I had never used Stayman apples for baking, always preferring Granny Smiths as my tried-and-true favorite. After hearing good things from locals about the Staymans, I figured it was time I given them a try. My plan was to make an apple crisp, which I tend to favor over pies, not just because they’re faster and easier to make, but, compared to a double crust pie, they seem almost healthy with their nearly virtuous oat and nut topping. But Jon wanted a “real” pie (I think the crust is his favorite part of a pie). We finally agreed on a compromise pie: it would have a regular crust on the bottom and a “crisp” topping on top (recipe below). Served warm with a scoop of vegan vanilla ice cream, it was apple pie heaven and really didn’t feel like much of a compromise to either of us. 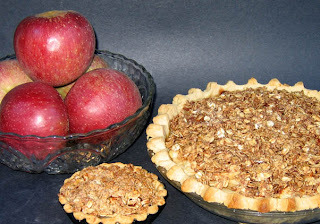 As the photo shows, there was enough ingredients left to make a little “taster” tart in addition to the pie. As for the Stayman apples, they worked out just fine, but I plan to stick with my Granny Smiths — I think they have more flavor and a better texture. Sorry, Staymans! 1. Preheat the oven to 400 degrees F. Cover the rim of the pie crust with foil and prebake the crust for 12 minutes. Remove from the oven, take the foil off the crust and set aside. 2. For the topping: in a bowl, combine the flour and brown sugar. Cut in the margarine until crumbly. Add the oats and walnuts and mix well. Set aside. 3. Peel and core the apples. Cut them into very thin slices and place them in a bowl. Add the sugar and cinnamon and toss to coat. 4. Spread the apple mixture evenly into the crust. Sprinkle the topping mixture on top of the apples. Bake until the apples are tender, about 45 minutes. 5. If the crust edges start to get too brown before the pie is done baking, cover the edges with foil. Two days prior to making stew, make a seitan pot roast (see recipe in March 7 post). Refrigerate the leftover pot roast and the 1/2 cup of leftover gravy. The next day, use some of the pot roast to make seitan “cheesesteaks” for lunch and put the small chunk of remaining seitan back in the refrigerator. For dinner, make pasta puttanesca (see recipe in January 19 post). Refrigerate the leftover pasta. 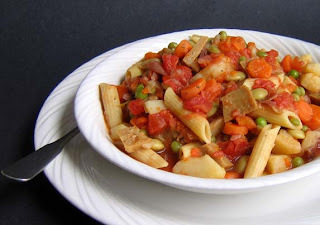 On the day of the stew, rummage through the refrigerator to find one onion, a handful of baby carrots, one potato, some frozen peas and lima beans, and that leftover seitan, gravy, and pasta from the two previous dinners. So there you have it. An impromptu stew that turned leftovers from two previous meals into a warming and delicious dinner. When Life Gives You Blackberries: Make “Ice Cream”! I can’t believe it’s already October. I have no idea where September went, let alone the entire summer. 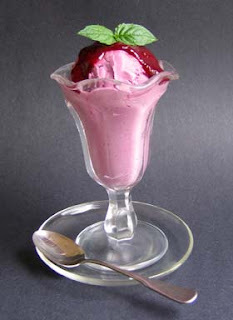 In an effort to recapture one final sliver of summer, I made homemade blackberry (dairy-free) ice cream yesterday. I used a container of coulis from my freezer stash made from our own blackberries picked what now seems like ages ago. Rather than following a recipe, I simply combined the thawed coulis with a container of chilled MimicCreme in my ice cream maker. Since the coulis and MimicCreme were both already sweetened, there was no need for additional sugar, and having them both icy cold made them transform into a delicious vegan ice cream in no time. I scooped it into dessert glasses and topped it with a spoonful of the rich coulis as a burst of pure blackberry goodness. Before long we were enjoying summer again, one luscious purple spoonful at a time.